Enter this giveaway for a chance to win an April new release worth $16. Good luck! I am most excited about The Beast by JR Ward. The Rose and The Dagger, The Star Touched Queen and Paper Princess! Hi Suze, I sorry but I can't remember the name of the book I want to read! I know it's listed on Goodreads & I entered a competition to try to win it. It's a psychological murder mystery/thriller, if that helps! Loads but the glittering court, one with you, when we collided. I am most excited about The Raven King. Thanks for having the giveaway. The Glittering Court & Dreamology! The Glittering Court, but it's so hard to choose! South of Sunshine by Dana Elmendorf! I'm excited for The Glittering Court! The Beast by JR Ward!! There Once Were Stars sounds really good. I've been telling people The Rose and the Dagger, but secretly (or not so secretly now) I would like The Star Touched Queen. :) Thank you for the giveaway. Water's Wrath looks VERY interesting. The Raven King. Love the cover and the series. I listened to it last year. Really good. I can't wait to read The Beast by J R Ward. The Rose and the Dagger! I'm excited about The Passion of Dolssa by Julie Berry. I'm excited about The Wedding Dress Kindle by Rachel Hauck. But, I haven't started it yet. I would probably choose The Glittering Court by Richelle Mead. I haven't read a single book of hers, I think it's time I picked one up. Dirty by Kylie Scott, so much, that I had to 1-click it and I'm currently reading it. I haven't looked them all over yet, but so far my favorite is "The Light of the Fireflies." I'd like to read Scarlett Epstein Hates It Here. Thanks for the chance to win! When We Collided and Dreamology! I excited about Dirty ! Can't wait to read Seanan McGuire's Every Heart A Doorway! I'm excited about the Raven King. There are several, but the one that sticks out the most is The Raven King! Walk the Edge by Katie McGarry. Thank you for the awesome giveaway! The Glittering Court looks great. The glittering Court & The Star Touched Queen and The Rose and the Dagger...etc. So many! I am excited to read Down with the Shine. I'm excited for The Rose and The Dagger, and Down with the Shine! 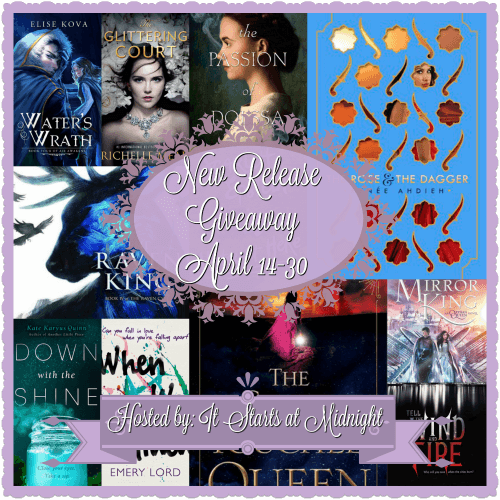 I entered your April New Release Giveaway. Which April new release are you most excited about? I am most excited about When We Collided by Emery Lord. I am excited and wanting to read Glittering Court by Richelle Mead. Water's Wrath and the Star-Touched Queen! Thanks for the chance to win! Believe it or not, I can't wait for the arrival of the INKLINGS COLOURING BOOK! I'm most excited about The Beast by J.R. Ward. Super excited for The Rose and the Dagger by Renée Ahdieh and The Star-Touched Queen by Roshani Chokshi.